Gaspard - could you please assure me once again you have not made (or seen somewhere) any of items listed in trac tickets, as I think I've seen eg. meat hook somewhere... Sorry for repetitively stressing you - I have not much time for drawing until Monday so I want to have clarity of what have or have not been done when I will be ready for PARPG, rather than think "I must have seen this somewhere..." instead. Anyway, what's the (more or less) size of inventory slot now? I'm doing 3d potatoes! 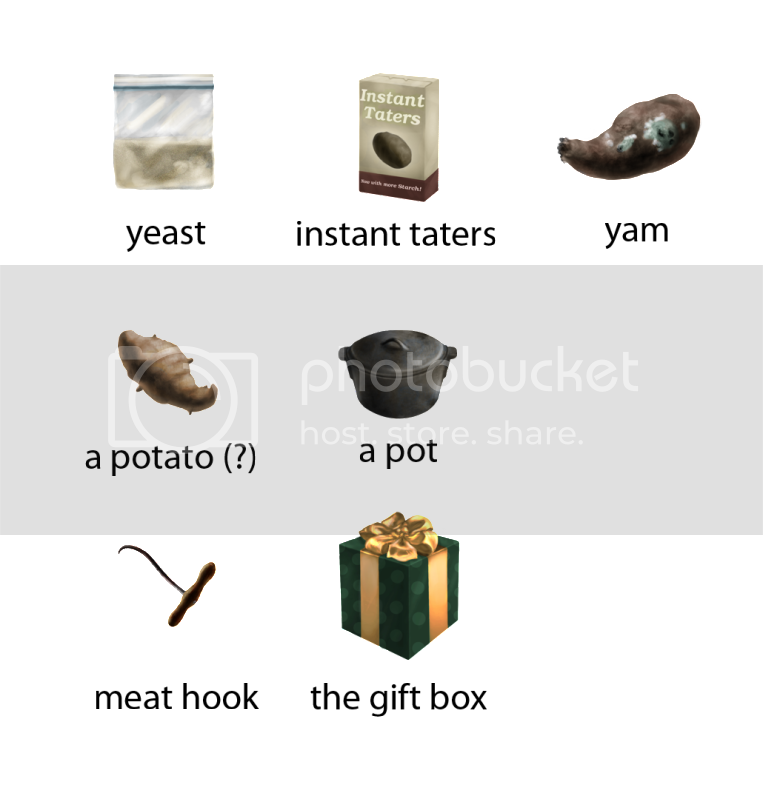 Neatso potatoes, could you post a larger version of those, something like 300x300 ? And I added why I'm not going to be involved into more serious things here. What's wrong with that? As for the words I'm using - it's my normal way of posting. Jesus Christ. Posting suggestions, or ideas isn't allowed here? Or maybe I must use some time period between them? Where I said you MUST change something immediately, or change something because I want, or do something because I say so? Show me where I did it. normal discussion about design aspect. What's wrong with that? suggestion to use placeholders there, if you not decided (before its release) what route you'll choose (2d or 3d, size, etc. ), and move to other things which are "known" now. What's wrong with that? But from now I'll shut up. Thanks for listening. You haven't been posting much at the forums before, Continuum, just an image here and there and minor comments. People here don't know you too yet and might get offended. Give everybody some time. Most of the raunchier talk goes on the IRC. Your input is very much appreciated, but we won't get anywhere if all the sides take things into heart that easily. Right now it was a series of misunderstandings, have some patience, man. You want stuff to move faster ? Log on to PARPG IRC channel. As a side note, if it isn't too much trouble then would you mind posting a larger image of the potatoes' render ? There is nothing wrong with changing stuff, Continuum, but if you are going to put everything into one post how easy is it to answer? I never said you are not "allowed" to do it. Do as you please. Bundling it together into one post isn't helping. And if you can not accept criticism, how would you expect others to accept criticism, please? Debundle complaints, this makes it easier for others to address them.